It is official! There will be a Sukkot gathering here in the Land of Goshen. I've had a couple in the past, but to be honest, I'm a boring introvert, so I'm not too confident in my hostessing skills, or if I even have any . . . but Father laid it on my heart. So, I stood on the faith that He'd equip me for what He's called me to do. As it turns out . . . He has brought some wonderful people into my life. There are no big earthly names scheduled to speak at this time, but some very big hearted individuals whose names are known by the Father! And who know His Name. Since Messiah said, "For where two or three are gathered together in my name, there am I in the midst of them," we are planning on that promise. There is no big list of activities, but there is big opportunity for fellowship for those of us who usually "Shabbat solo." Although folks are welcome to do their own thing regarding meals, we do ask that you keep it kosher. We plan to have each person take a day to "be in charge" of the kitchen while the rest of us help . . .
We also invite folks to bring their instruments. I can provide basic minimal keyboard, and I've often entertained the thought of being a part of "The Joyful Noise Band," as "noise" is pretty much my level of musical talent. I do however; have the joy, joy, joy, down in my heart! Also planning to have a guest pasture for anyone with a milk goat that needs to come along, but you must contact me to make arrangements. Please don't just show up with livestock in tow. All guest goats will share accommodations. While diversity has become a hot button topic in politics and media. Choosing the proper progressive terms has made quite a myriad of labels to be handled with kid gloves in our society . . . The PC term for "handle with kid gloves" is "celebrate," which of course has resulted in disagreement and negative labels, a.k.a. name calling. I am, however; celebrating a different type of diversity. Any given day around here, simple diversity abounds. There is no need for PC labels, as this is life. Whether indoors or out, I am continually aware of the beautiful life that our Heavenly Father has blessed me to live. On this homestead are goats and gardens. Several months of the year there are veggies to be harvested and eggs to be gathered from free range chickens. The hot days of summer are divided between the swimming pool and canning, with the usual housework, of course. The blessing of working from home in my own natural health business, not only blesses me, but those who come for knowledge and products. Then there is the enjoyment of writing. My latest book published last month. I pray it's a blessing to all who read it. With the addition of a milk cow, cream, butter, and a great deal of my cheese is now supplied here, as well. In all this, it seems there is always a blog topic! I truly am blessed with the real meaning of diversity. Diversity is not just a political term to argue about; in my life, it's a way of living! Don't even get me started on ducks and dogs and donkeys! Well, I will digress, momentarily, in that I am blessed with a duck who is friends with both the donkey and dogs. This homestead truly is blessed and is a blessing. I tell Father that every morning through chores and countless times through the day, from the kitchen to the office, to the deck, to the pasture, to the pool! That's not to mention the lab, the inventory room, the milk barn and the milking parlor. I truly am blessed to enjoy a very full life of diversity and I'm enjoying it! As the ministry of sharing this place with others to experience, expands, the blessings increase! Having been in ministry for 10 years before being called to this, I hadn't realized just how important agriculture was in Scripture. It was one of those "face palm" moments, as I realized the background of nearly every Bible story has fields and animals, grain, wine, oil, someone who heard Our Heavenly Father and wrote it down. When I became a Covenant believer, I told Father I wanted to "live the Bible." He's answered that prayer! HalleluYah! I see post after post about folks stepping out in faith and the trepidation that comes with that move. For some it's easy, it's often only a temporary visit and the expenses are covered. For others, it's a life changing opportunity that will dramatically alter their lifestyle. Since I've made a couple of those, I'd like to offer this for those who are weighing the possibility and the potential for a major move. I was shown a pillar of fire late one evening, but told to wait until I saw the vision. I did know the direction, however; and that was all. Early one morning, I was shown what the destination looked like, but was absolutely clueless as to the town/address. I still knew the direction to set out. It truly was that simple. Upon seeing the vision, in the early morning, I packed a bag. When the business day began, I called a realtor, signed the papers, and I was heading south by south east, as he was placing a for sale sign in the yard. Actually . . . more than one for sale sign in more than one yard . . . It would be two days before I arrived at the place I'd been shown in the vision, then it would be another day of a harrowing situation in which I just wanted to jump out of the car and do my own real estate deal, but I digress . . . Ultimately, the proper deal was offered and accepted. A few strange occurrences took place, as I was readying for the closing, but all was extraordinarily resolved. When I was heading to the closing at the end of the month, I noticed a pillar of cloud to the west of my new destination. I tucked that fact away, but over the next three and a half years would "ponder it, from time to time." The first year on the homestead was exciting! I wasn't sure exactly what I was doing, but I knew my leap of faith was the right thing to have done . . . Then the second year on the homestead caused me to question everything . . . I don't have words for the devastation I felt. To be honest, I'm no longer the same person I was. What I went through was not as grievous as burying a child, but on the other hand, the ongoing reality left a strange void with an obligation that would have to be continuously worked around without resolution. Moving along to the better part of this "stepping out" story! The third year of homesteading was hard, because I had to set aside all of my expectations and let the hopes I'd had; die, which was scary and scarring. Upon surrendering my hope in the natural, Father opened a door that was completely unexpected and a total blessing that continues to this day. About three and a half years into the homesteading project, I was called to host a radio show. It was such an opportunity! In the hour show, I covered everything from gardening to politics as well as a segment discussing Scriptural truth. Shortly after the show began, however; I once again heard Father tell me it's time to move . . . That's right, He said specifically, more land with a well. Having already enjoyed the blessing of a well on the place, I had learned the value of something our society has let slip away. A clean water source is invaluable! So, the search was on, and for a time, I was looking in the wrong direction, as the radio station was east of me, but the radio show was just a stepping stone to the bigger plan . . . Father brought to my remembrance the pillar of cloud to the west. January, the radio show began, February, found the new place, and March, the deed was in my hand! I realized in the midst of all the busy-ness and new experiences, I'd been blessed to have enjoyed a long forgotten desire of my heart. As a young woman, I'd wanted to spend a winter writing a book. I began writing the first week of December after processing Daddy's deer, and it went to the publisher's desk the week after my birthday in March! 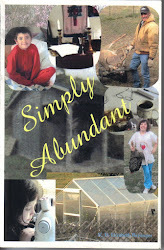 "Simply Abundant" was published in April. It's now the ninth year on this new place. It is five times the size of the starter homestead, a few more books have been written, a milk cow and raising my own beef have been added. I started a soap and natural health product business, and this past year a teaching facility has been added for conferences and workshops. The schedule is somewhat established, but still working on details. Stepping out can be frightening, from our perspective, as it is definitely into the unknown. Father, however; has a much better view, and He knows where He's leading His children. As I learned in laying down my original homesteading hope, I have received abundantly more than I could have asked or imagined! This spring was a bit unusual, following such a mild winter. In April, so many things were blossoming simultaneously, that are usually a bit more consecutive than congruent. Then May, it began to balance back out and although a few of the berries were early this year, the strawberries were right on time, with the first of them ready for Mother's Day. The strawberries are absolutely delicious this year, from my new raised bed. The real treat, however; has been the early morning fragrance, as I enjoy the open windows. The goats have an interesting aroma in the spring and early summer. There is an air of fresh milk that I find truly appealing, while the bucks are now in the north pasture. The buck scent is subdued through the kidding season and the kids are still nursing. The faint scent of fresh milk is not at all overpowering, but just one of the fragrances of spring. Now, add to that, the smell of strawberries! That would be enough, but there was more this year . . . 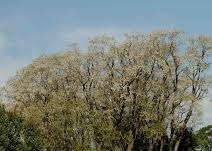 The honey locusts bloomed a bit early and wafted sweetly on the southern breeze. But wait, that's still not all . . . 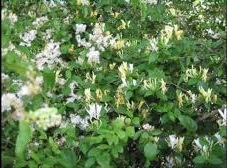 Giving all glory to our Heavenly Father, the west lane is now covered, not only in blackberries, but honeysuckle. The two indigenous plants seem to thrive well in the same general area, so double portion blessing. It is not only smelling good through May, but I'm thinking late June through mid July, the blackberries will be tasting good as well. As I've stood at my kitchen window inhaling and embracing every fragrance of spring, I compare it to what heaven must smell like. I think of how wonderful the Garden of Eden must have looked and smelled . . . and I envision the new earth and the millennial reign. The fragrances of this year have truly been as close to the scent of heaven as I can imagine. This summer, I officially maxed out on the schedule. Without really mentioning my situation or giving details, I asked for prayer on my social media page, and I'm grateful for the prayers. Since I didn't give details, I'm not sure what was assumed, but my situation was simple. I have been so busy, my time with Father was getting cramped or minimized and that simply will not work in my life! As I scrambled my schedule, and found myself regretful at the end of the day, I realized, anything that comes ahead of time with Father, can be and probably is, an idol. That can include my own order of priorities, even family and yes, even, ministry. I'm not making an excuse to ignore our commitments, not at all, but I am here to tell you, we can get "over committed!" This project of building a small learning village was quite an undertaking, to say the least. Thinking, I would be all finished before canning season, was first and foremost, wrong . . . so I ended up dealing with contractors through canning season. To make matters more interesting, I also bought a cow the end of June. As blackberry season came in the midst of all the half finished projects, I developed a new product for the Land of Goshen . . . Just as I kicked into high gear on so much going on, my old method of handling stress kicked in. It's not often that I think I have too much to do. Most of my life, my Daddy has commented that I have "too many irons in the fire," but I never felt that way. As a matter of fact, when I mentioned to my daughters, I just had too many things going on, they both said, they'd never heard me say that, before. At any rate, when my schedule gets cramped and I get spread too thin, my coping method is: to find another project! Add more to the schedule! That's correct. "Getting busier" is how I handle being overwhelmed. This summer that put the fear of G-d, in me, literally! After having a rather rough winter with the herd, I got busy being busy with the new project, Bethesda. I knew what I was doing was led of YaH, but I was also filling some of my time with very unnecessary things. Then the evenings became entrenched in more busy-ness that really accomplished very little. The first thing I realized was, I had stopped making a daily "to do" list. I'm not sure why, but I had . . . The next thing I realized was my evening devotions were being crowded out as the phone was getting busier. I realized it was all simply too much, when morning devotions began to feel like "going through the motions," to get on with the day. I was spiritually parched and a feeling of forlorn engulfed me. It scared me! I found myself waking up in the night and crying out to YaH to please hang on to me. I knew I had to complete something that had been relegated to a back burner, while I made myself busy being busy; and life was simply wrong. I determined to get order back in my life and I knew my priorities needed to change before I asked YaH to order my steps. How many times had I heard Him call me away from my "busy-ness" but thought to myself . . . in a few minutes. Fear of YHWH began to set in. He has to be first in my life, and that means, first. Not after my latest idea, not after the next phone call, not after this homestead to which I've been blessed, and certainly not second to the ministry I have been called. Busy being busy might be the most subtle way to fall away . . . So thankful for His mercy. When I first began this project, cattle was not part of my plan, but I've been shown more of The Plan and there are cattle involved. When I first began homesteading, I was just on two acres and had plenty to learn; but I already knew 2 acres was not enough for cattle. My first presumption was that I would stay on the 2 acres for the rest of my days. I never even asked, but I heard otherwise after 3.5 years. From the time I heard "more land and a well," to signing the check and receiving the deed was just 3.5 months. In that time, I also had my radio show and when I heard a move was in the plan, I presumed I'd be moving closer to the station. Again, my presumption was wrong. I feel very blessed that YaH continues to graciously allow me to hear His voice, even though I frequently wrap His Words in my presumption. I am very careful, though, to keep separated, His Words and my afterthoughts of presumption. I don't want to operate on my presumption or expectation. I've been raising bottle dairy bulls for a few years now, giving them goat's milk until they are ready to wean. The grassfed beef is wonderful and the last couple of years, I've been spoiled and not had to process them myself! I haven't bought milk or eggs in over a decade, but I'm still buying butter and cheese . . . that is changing. Annabelle has come to Goshen. She is a big beautiful five year old Jersey cow, who had gotten out of sync in the calving cycle at a local dairy. She was bred when I bought her, and due to calve next month. Sadly, that situation did not go as planned. Something went wrong with the umbilical cord and unbeknownst to me, the calf lost it's food and oxygen supply . . . Thankfully, Annabelle delivered the deceased calf before it affected her health. To be perfectly honest, of course, I'm a bit disappointed, but I had heard two things from YaH when I bought her. He told me the calf would arrive in August, and I'd not be raising a bull calf this year. Let me tell you a little something about presumption . . . For starters, it's not the same thing as faith. When I heard the calf would come in August, I presumed, the dairy owner simply had her dates mixed up, as she said she couldn't remember exactly when the vet preg checked the cow. When I heard I'd not be raising a bull calf, I presumed, Annabelle would have a heifer. Now, when the reality of the last few days settled over me, I remembered distinctly what I'd heard, and what I'd heard happened exactly as He'd said. It was my presumption, however; that was 100% wrong. Annabelle and I have now settled into our milking routine. I think I have a butter making schedule, and the cheese experiments are coming right along. I don't like to waste anything, but in learning, sometimes the experiments do not go as planned. I am blessed to know, in the event something is not palatable, it is still 100% edible by dogs, cats, and chickens. The first week of spring was actually a bit chillier than the last month of winter, but spring has arrived. I have already received my first rainwater rinse of this new season and, as always; it was refreshing. The kids and lambs are quite energetic and noisy. The chickens have stopped slacking in egg production and the perennials are dormant . . . no more. A couple of years ago I tried "something" with a natural raised bed of strawberries. Basically, it was three rows of straw bales with bedding fabric between filled with top soil and strawberries. When overnight temps this past week were forecasted to dip below freezing, I headed out to cover what was green. To my delight, the strawberries have really spread and are thriving well. There were even a few blooms already. Every year, I attempt to try something new. This year is no exception. I'm attempting to raise my own non-GMO wheat. Stay tuned for further updates. Now that the ducks have a larger pool, I've repurposed their old kiddie pool to sit on an old wrought iron table for the ultimate in a raised strawberry bed. 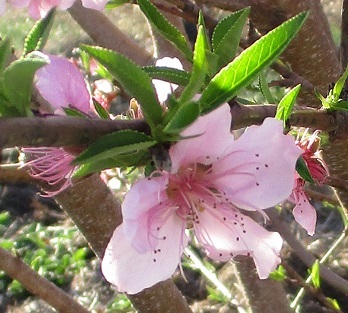 The peach tree was loaded with blossoms and appears to have weathered the nippy nights quite well. Sunshine is just as spunky as she can be . . . while Darla is just a tad aloof, but learning her way around he milking parlor. The newest addition to the place, my small herd of Barbados sheep. Selma and Blanche are in front looking at the camera and Freida is all the way to back with her twin ram lambs in the center of the photo. Some of this year's kids have already been sold. Springtime in the country is just wonderful.